Resignation as a member of the Royal College of Psychiatrists. I am writing with a heavy heart as I have decided to resign from the Royal College of Psychiatrists after nearly 25 years of membership. Please accept this letter as my formal instruction of resignation. (1) Evidence does not support the conclusion of the Royal College of Psychiatrists that “the relationship between the College and Pharma is distant” [Vanessa Cameron, previous CEO, December 2016] and that “College policies and procedures around declarations of interest are sufficiently robust” [Paul Rees, current CEO, June 2018]. As a direct consequence informed consent and realistic psychiatry are compromised. (2) I am concerned that the core values of the Royal College of Psychiatrists are not always being upheld. It is my view that this has been revealed through the College approach taken to those who have shared less than positive, and sometimes harmful, effects of psychiatric interventions including prescribed medications. I would urge the Royal College of Psychiatrists to support Sunshine legislation for the UK. The Royal College of Psychiatrists needs to carefully consider and address the harms associated with what the BMJ term “too much medicine”. Practising realistic psychiatry requires ethical considerations to be at the heart of all that we do. The President of the Royal College of Psychiatrists has confirmed that the College will not be responding to the issues of concern that I raised in my letter of resignation. Both the Vice President and President of the Royal College of Psychiatrists have expressed concerns about my mental health. Unknown to me, the Vice President contacted my employers. I have now been asked to meet with the Medical Director for NHS West Lothian. I find it disappointing that College leads have not shown similar levels of concern for the values that I am trying to encourage in British Psychiatry. I am concerned that the Royal College of Psychiatrists has chosen to brick-up its windows. My published article on Iatrogenic Stigma was called 'Window Tax'. Update, 9 January 2019: Occupational Health Assessment. "Thank you for asking us to meet with Dr Gordon. He attended the appointment in the occupational health department on 9 January 2019. This communication is written with his knowledge and his consent. We had a very detailed discussion. As you are aware, he is currently signed off work. From the information he provided and from the contents of your recent email, this ongoing absence from work is not in any way linked to concerns about his ability to safely perform his duties at work. Dr Gordon has been reflecting on long-standing views that he has held and the impact these have had over the years. We discussed frankly about the current situation, the potential options open to him and the steps he could take in the future. Dr Gordon plans to reflect on the content of our discussion." Forgive me writing on a Saturday morning. I am aware that the “HR Department” has instructed me not to. However I am now no longer a member of the College. I was disappointed to learn from Professor Burn that the College will not be responding to my concerns raised in my letter of resignation to Dr James on the 24th November 2018 (I have attached the original letter). Yet, at the same time concerns have been expressed by President Wendy Burn and Vice-President John Crichton about my mental health. The Vice-President has, I understand, spoken to my Medical Director about his concerns and I have now been invited to meet with him. I noted one of the issues of concern raised by Dr Crichton in his College Blog of this month: “If ways could be found now to encourage those approaching retirement to continue to contribute to the NHS part time – not to fill gaps but in posts which make the most of their experience – that could be the start of a model of how careers might look in the future when retirement ages are later.” My experience of raising concerns with the College has led me to the stage where I am considering my future within the profession. If the College is serious about retaining experienced staff I would encourage it to reflect upon its approach to respectful behaviour in relation to College values. I would be most grateful if the College would reconsider its decision not to respond to the concerns I raised in my original letter. It is some weeks now since I resigned from the Royal College of Psychiatrists having been a member for almost a quarter of a century. My intention is to switch focus to my other areas of interest. The following is a summary of the two main areas that I raised in my letter of resignation [it is my understanding that the Royal College of Psychiatrists does not intend to reply to this letter]. As a GP patient who has been left severely disabled by 10 years of prescribed benzodiazepine drugs at a large dosage, i welcome your honesty and integrity. It is a great pity that more of your peers do not have your moral values. 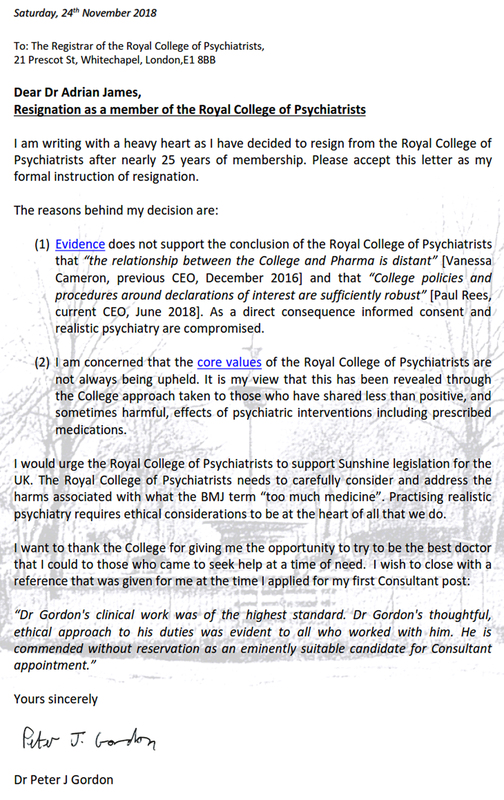 An extremely powerful resignation letter from one of the few ethical, humane (and non Pharma-compromised) psychiatrists in the UK- Dr Peter Gordon. Peter has long been a great advocate for those harmed by psychiatric medications. He has had direct experience of harm with the SSRI Seroxat. He also has tried to make his Royal College of Psychiatrists more ethical and transparent for many years. Unfortunately the college’s response has been lackluster and at times it seems Peter has been marginalized. At one point, a few months ago, he was told not to contact Wendy Burn (the royal college president) about his concerns. Peter has been treated disgracefully, and the Royal College should be ashamed. I hope that Peter continues on his path of blogging, writing, and bringing awareness to these issues. Perhaps now, free from the dogmatic chains of bureaucracy within the College of Psychiatry UK, Peter can be even more honest and transparent about his views. We need more Peter Gordon’s in this world in every facet. It’s a shame that the Royal College doesn’t value the beacons of hope and light like Peter, and instead protects it’s own interests, and Pharma’s interests, before ethics, and patient’s lives and health. Not surprised in the least at the integrity shown here by Dr Peter Gordon. More doctors should follow his brave example. Bad things happen when good people do nothing. I agree with the previous posts. Clearly, Peter is a man who bravely stands by his principles. The word ‘hero’ is much overused, however, here it is entirely appropriate. The definition of a hero is: ‘a person who is admired for their courage, outstanding achievements, or noble qualities’. I can safely say that I believe all these qualities and more are embodied by Dr. Gordon. A tireless campaigner for truth and purity in medicine and someone whom I hold in extremely high regard, Peter is living proof that psychiatry can be practised morally, ethically, responsibly and free from bias. It is hugely sad to see him resigning. Psychiatry is not only shunning patients that challenge its ethos, it is turning on its own. I’ll second all that. The RCPsych has stooped to a new low here, this is outrageous. I wish you all the best Peter. Total respect – you must have had to think long and hard about this decision. Good wishes to you. I read your resignation with a very heavy heart, as medicine has lost one of the most compassionate, ethical and courageous doctors I’ve ever had the privilege to meet. It is also a great loss to your patients and to the profession of Psychiatry. At the same time, a applaud you for your integrity and for being a Spartan. With love and friendship, and the deepest respect for you, respect I’ve rarely felt for another human being before. legal. You should not have to leave because your profession is profiteering by human rights violations. So very few demonstrate such absolute commitment to safe and effective patient care, at such great personal cost and sacrifice. Your sincerity, integrity, courage and total commitment are afforded utmost respect. Very few afford absolute priority to safe and effective, compassionate and empathetic patient care at such great personal cost and sacrifice. Great decision, but who is Peter J Gordon? I am currently trying to help two people who cannot tolerate certain kinds of medication and both being told their problems are psychological and not iatrogenic. The harm from medication is played down and hardly touched on in medical education. You need support for your courageous stand in an era when poly-pharmacy and lack of withdrawal support are harming so many. The fact Dr Loren Mosher resigned from the American Psychiatric Association for the same reasons you cite, about 18 years ago, shows how little progress has been made in moves towards ethical psychiatry. Many people are suffering,so the system of random diagnoses and the over use of drugs is not working. In 2001 to bring together brave medical professionals and the public, a conference was organised. This was my idea following Dr David Healy being ousted from Toronto University for daring to mention to a group of doctors the risk of SSRI induced suicide. I was informed by an award winning mental health journalist, this conference led to the Panorama programmes on Seroxat. Possibly it being the first ever conference on ‘Psychiatric side-effects of medicines and anaesthetics’ and with no pharmaceutical industry funding! So many health professionals were free to network with the media and each other without being watched! I feel and am supported by a lecturer in ADRs, it is time for another conference on the serious issues around patient safety and the lack of knowledge by prescribers of ADR harm from medicines. There are over 25 videos linked to our charity web site, about how clinical trials are rigged , the problems coroners have in getting support when they suspect iatrogenic deaths and issues around genetics. Peter. I am sorry, but not surprised this has happened to you. Please make sure if you meet with your employer you bring a lawyer. Also record the conversation. In light of the recent attack against you by the RCP (they have blocked me so I cannot read what they wrote, only the twitter responses to it) for your public resignation Peter, I hope you will consider the important opportunity this presents to legally address it as a discriminatory Human Rights violation. Perceived ‘mental” & physical disability are protected grounds. For example, employers who fail 2 accommodate for someones imaginary “mental illness” are found guilty. There is no reason that the opposite scenario (people accused of being “mentally ill” with no evidence supporting the existence of and such “disease”, hence there is no valid reason to drug them. Further doing so without full legal informed consent is medical malpractice and insurance fraud. People who are stereotyped, shamed, stigmatized, liable & slandered with fake diseases, should sue. Best of luck to you.